Ukraine will not repay a $3bn debt owed to Russia by this weekend, claiming Russia has refused to accept repayment terms already offered to other international creditors. The moratorium means that Ukraine is likely to default on the debt, which is due on Sunday. In addition, repayment of $507m of Ukrainian commercial debt held by Russian banks will also be halted. The countries have been at loggerheads since Russia annexed Crimea last year. Ukraine's Prime Minister, Arseny Yatseniuk, said Ukraine had imposed a moratorium on the payment of a $3bn eurobond held entirely by Russia, which is due to mature on 20 December. He did not say how long the moratorium would last. Moscow had previously said it would take Ukraine to court if it did not pay on time. The moratorium will be in place "until the acceptance of our restructuring proposals or the adoption of the relevant court decision", Mr Yatseniuk told his government. "We are prepared for court action from the Russian side." Relations between the two countries have been tense since Russia annexed the Crimean peninsula in 2014. Ukraine and the West have also accused Russia of arming and aiding separatist rebels in eastern Ukraine, allegations that Russia has denied. 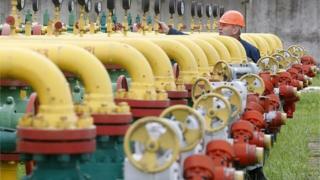 In November, Russian energy supplier Gazprom halted gas supplies to Ukraine. On Wednesday, Russia said it would suspend a trade pact with Ukraine that would exclude the country from a free trade zone that includes former Soviet countries from 1 January. Ukraine said it is "ready to pay the price" to join an EU free trade zone from that date.